BECS, along with the Board on Atmospheric Sciences and Climate and the Water Science and Technology Board oversaw this activity that was a bi-national collaboration between the U.S. National Academy of Sciences, with support from the George and Cynthia Mitchell Endowment for Sustainability Sciences, and the Mexican Academy of Sciences, Academy of Engineering, and National Academy of Medicine. It brought together experts from both countries who discussed the key sustainability challenges facing stakeholders in the Mexico – U.S. drylands region and binational priorities for research that could promote sustainable development. Potential binational priorities for research that could advance use-inspired research to promote sustainable development in this region, such as adaptive water management, health ecosystems, strengthening local and regional economics, enhancing community and population resilience, and reducing impacts on vulnerable populations. A short, accessible summary (proceedings) of the workshop will be published in accordance with the U.S. National Academies' policies for such publications, including the standard review procedures. The summary will be a joint document published in English by the US National Academies Press and in Spanish by the Mexican Academies and will be used to help stimulate interest in additional bi-national collaborations. The workshop will engage academics from both countries, potentially relevant agents (e.g., boundary organizations) capable of supporting the implementation of efforts to advance sustainability science and promote sustainable development in the region, key agencies in both countries, and philanthropic representatives. The workshop will be held on May 2-4, 2018 at IPICYT (the Positino Science and Technology Institute) in San Luis Potosi, Mexico. May 2nd will consist of field observation and local demonstration. The panel discussions and breakout sessions will take place on May 3rd and 4th. The planning committee for the workshop consists of five members from the U.S. (including the workshop chair) and five members from Mexico. The committee is responsible for outlining the workshop agenda, identifying speakers, and helping NASEM staff assemble a list of invited participants. 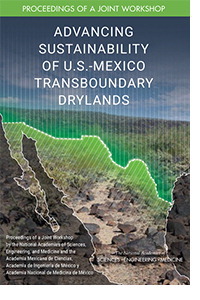 The drylands border region shared by the United States and Mexico is currently facing multiple sustainability challenges at the intersection of the human and natural systems traversing the borders of both nations. Warming and drying conditions threaten surface water and groundwater availability, disrupt land and marine-based livelihood systems, and challenge the sustainability of human settlements in both nations. This is an important moment to provide an opportunity for collaborative planning and co-produced knowledge among diverse stakeholders and research communities on both sides of the border. We have an unprecedented opportunity to create new platforms for collaboration. Both countries are rapidly increasing their capacity to understand climate-related challenges and opportunities, yet little has been done to develop the bi-national scientific, policy, and management capacity that is needed to promote sustainable development in the context of climate change. The U.S. National Academies of Sciences, Engineering, and Medicine will undertake this activity in collaboration with the Mexican Academy of Sciences, Academy of Engineering, and National Academy of Medicine. The workshop will help develop a shared understanding of the challenges facing the region, assess the scientific and technical capacity that each nation can bring to bear in addressing these challenges, and identify new opportunities for bi-national research collaboration and coordinated management approaches in the advancement of sustainability science and development. The workshop is viewed as Phase I of a longer term collaboration which would include a consensus study aimed at a more systematic review and specification of recommendations for use-inspired sustainability research and sustainable interventions in the region.